COPRA RF has been global market leader in the field of roll forming software. That is not only because we make the design process as effective as possible for producers, but also our employees constantly advance our solutions and acommodate ever changing demands from the industry. Since modern roll formed products go through extremely long lines with additional steps like welding, embossing, bending or also Inline measurements. This means tough requirements for solutions that are merely met with good software alone. COPRA RF comprises all the experience of our long-serving employees that are not only software devolopers or engineers, but rather genuine roll forming experts. COPRA RF covers the whole roll forming process chain and provides tailor-made software solutions for tube makers and profile manufacturers alike. 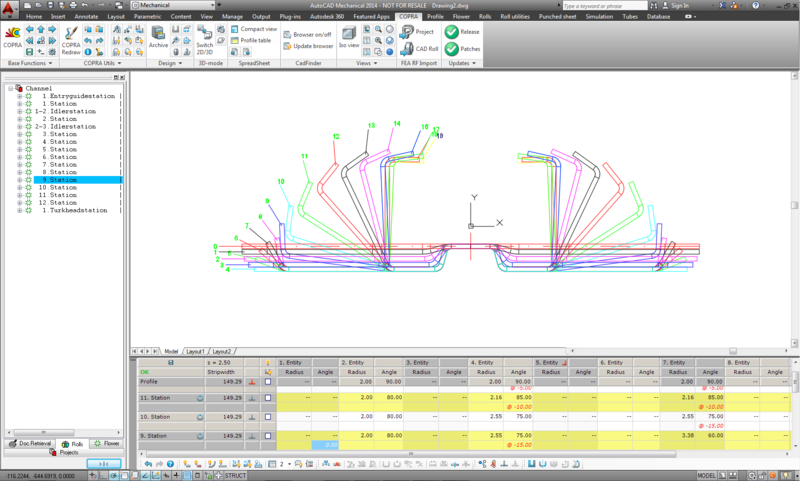 It is integrated in the COPRA workflow and thus allows unlimted possibilities for process optimzation. Therefore, you can successfully conduct a simple roll tool design as well es the implementation of a complex roll forming line. Our software module for design and development of open as well as closed profile cross sections alleviates the work of designers by a great deal. Additional analytics modules enable optimization of the entire process. For efficient design of roll tool in tube mills, COPRA RF Tubes provides various pre-defined forming strategies and auxiliary functions (automatic tube mill). The software is suitable for round and rectangular, as well as flexible tubes.